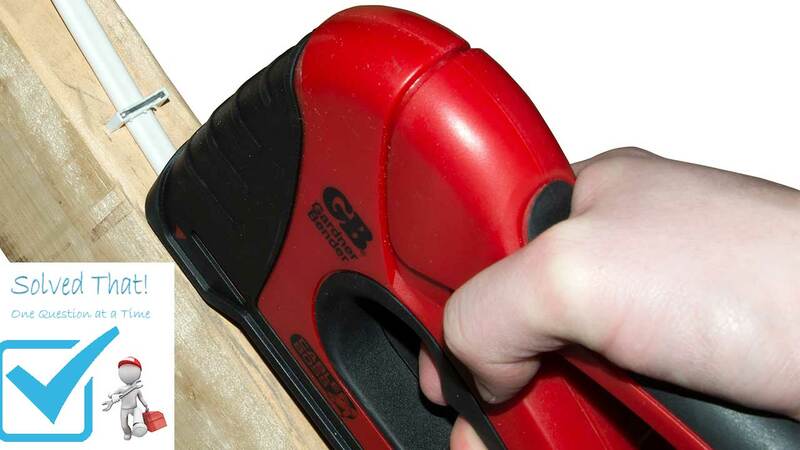 BEST ROMEX STAPLE GUN | GARDNER BENDER CABLE BOSS MSG 501 | Solved That! Recently the decision was made to add some flood lights to the ends of my home. This was no small task as I live in a raised ranch with a very low attic with no floor (See picture above). The first part of the process of installing these lights meant I needed to run a couple hundred feet of 12/2 romex and staple it in place on the roof joists. That’s where things became difficult for me. I immediately learned that about 90 percent of my (NM) romex stapling was in locations that were impossible to swing a hammer and drive in the romex staples. After a bit of bloody knuckles, holes in my head roofing nails and a bit of anger I came up with an alternative plan for securing the romex to my roof joists. 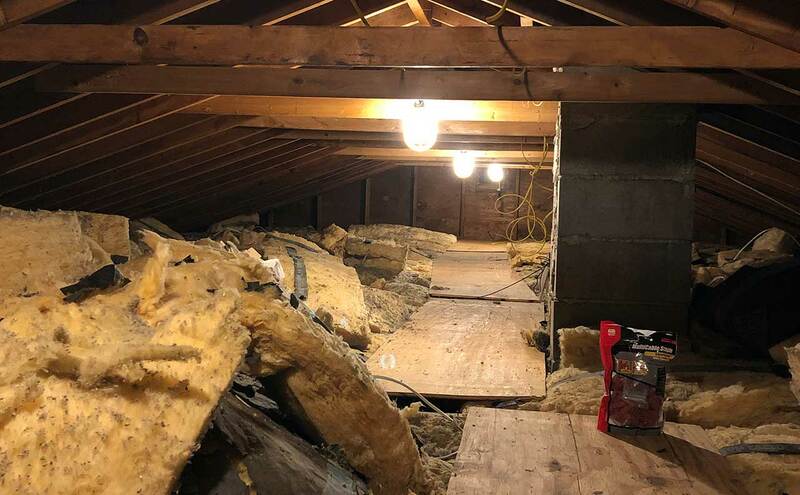 I did some research on wiring attics and learned I was not alone in my plight, a few other had used a product from Gardner Bender called SnapSHOT Multi Cable Staple part number MCS-20W. As luck would have it I had a bag of these on hand for my next project of running coaxial and Cat 6 in the attic to the rooms below. The Snapshot Multi Cable Staples come with a wood screw for the flush end and a nail for the tall end. The nail was replaced with a wood screw. Problem solved? Not exactly. The Snapshot Multi Cable Staples were a good idea in theory but in practice using my Bosch cordless drill or a traditional philips screwdriver was nearly as challenging as swinging a hammer on the NM staples. I needed a new plan and at this point I was prepared to throw some money at the problem. I set out to research staplers for wire and cable. I was hoping to buy a purpose made pneumatic or electric staple gun designed just for my needs. My research was disappointing. At first I was excited to find exactly what I wanted in the HALEX Quikstrap Staple Gun. Unfortunately it seems like that the tool is no longer available. Typical of my luck. A bit more searching turned up three manual staple guns that could staple romex and other common cables. The first stapler I had high hopes for was from the company Arrow Fastener. Arrow Fastener makes the best manual staple guns, period. Arrow makes two models the Arrow T75 and Arrow T72 that are suitable for romex stapling. I was excited until I wasn’t. Most reviews on both models are dismall. The reviews were not a deal breaker though. The fact that neither Home Depot or Lowes stocked it in store was. I actually wonder if poor performance is the reason for it not being stocked. This left me with one option, the Gardner Bender Cable Boss. The GB Cable Boss MSG 501 reviewed slightly better than the Arrow Fastener models and both Lowes and Home Depot had stock. Off to the Waterbury, Connecticut Home Depot I went. Aisle 46, Bay 012 had the goal of my quest. The Cable Boss cost $29.97, a box of 200 3/8″ romex staples cost $9.97 and 1/2″ was $6.97 for 200. For the life of me I can’t figure out why there is a $3 difference in the staples. Once home I headed straight for the attic. I removed to Cable Boss from it’s clamshell packaging, gave the instructions a quick read and off to work I went. The first thing I needed to do was reverse the tip because that was the end that fit the 12/2 romex. The tip was a bit hard to insert in this orientation as opposed to the reverse as shipped from the factory. Loading the staple gun is easy. Like most heavy duty staple guns you push the tray in, pull down than pull out. The stapler holds one row of staples from the box. I think they are rows of 20 but I didn’t count. Load the stapler in reverse of unloading. I immediately headed to one of the more difficult areas in my attic. I lined up the romex in the rear guide and the nose of the stapler and “BANG” I had a perfectly installed romex staple. That first staple had me arrive at two initial observations, one is that the stapler takes quite a bit of effort to squeeze and two the wire of the staples is quite a bit thinner that I had expected. Of course both of those observations make sense. It takes quite a lot of energy to drive the staples and the thin wire of the staples makes it doable by a manual stapler. Regardless I was Impressed. Over the course of about an hour and a half I stapled all the romex in my attic. Talk about a time saver. The night before it was taking me about 5 minutes per GB snapshot. A few notes about use. You must apply a substantial amount of energy to oppose the force of the driving staple. Combine that force with the energy required to squeeze the staple gun and you come to realize that you need a fair bit of strength to use the Cable Boss. This required strength translates into some difficulty stapling in awkward positions. Not a big deal though. When I got tired I spent some time doing the easy areas. The only time the stapler failed was when I needed to staple on a wood knot. On a few knots I had to tap the romex staples once or twice. Other than that the tool performed absolutely perfect, not a single jam or malfunction. I suspect folks who have trouble are simply not applying enough pressure to the staple gun and its bouncing. I give the Cable Boss 4 out of 5 stars. I subtract one star because of the effort required to squeeze the handle might be too much for some. I would like to see Gardner Bender make one improvement, make a model that ratchets until firing. This would make the tool much easier to use? Is the Cable Boss the Best Romex Staple Gun? In such a narrow field with plenty of room for improvement i would say yes the GB Cable Boss is the Best Romex Stapler. I will try and get some video of the Cable Boss in use real soon. Next time I will be using it on RG-6 and Cat 6E Ethernet Cable, stay tuned. Gardner Bender provides a complete line of staple and fastening solutions for all industries, including industrial, residential, construction or manufacturing. From low voltage wire to service entrance cables, professionals rely on Gardner Bender for quality fastening products. Cable Boss staple gun secures 120-Volt and low voltage cable: Romex, coaxial and CAT5 from the same tool. Features include comfort grip areas for 2 handed operation, easy trigger force and ergonomic handle. Rugged construction capable of surviving a 10 ft. drop. Other features include a reversible cable guide for easy cable stapling change over, a staple refill window to view remaining staples and a rear cable guide for added cable control reduces cable twisting. Secures round and flat cable, 3 sizes covering NM, coax, voice/data and low voltage. Thanks for your feedback on our T75 and T72 tools. Where did you read the reviews you referenced, and what were some of the popular issues described? These are specialty tools, but we do offer them at a number of independent hardware retailers, as well as on Amazon.